Sometimes even good garden soil can use a boost. This page contains homemade liquid fertilizer recipes. One of the fundamental principles of organic gardening is to "feed the soil, not the plant." The idea behind this concept is that if you start with healthy soil in the first place, you won't need a lot of additional fertilizers. That's good advice, but sometimes even Mother Nature appreciates a little boost. Organic liquid fertilizers and teas are a good options, because they can provide plants with nutrients in a readily available form. Here's all you need to know to make your own. This passive method works well for making small quantities of very concentrated liquid fertilizer from plant leaves. Stuff the bottle full of leaves (see appropriate plants below) and top them off with a sprinkle of water. Drill a tiny hole into the bottle cap and screw it back onto the bottle. This is where the concentrate will drip out. Place the bottle, cap-side-down, over a small container to collect the dripping concentrate. After 2 to 3 weeks (maybe sooner) a dark liquid will drip out. Dilute the concentrate with 10 to 15 parts water. This is another passive technique for making fertilizer tea. Fill an aged burlap sack or old nylon stocking filled with your fertilizer source and immerse it in a 5 gallon bucket filled with water. Add 1 ounce of unsulfured molasses (to provide a food for beneficial organisms). Cover the bucket and allow it to steep for the directed amount of time. When finished, strain off the solids by carefully lifting out the burlap or nylon stocking. The solids can be returned to the compost pile or worked into the soil. Fermenting times: plants = 2 - 4 weeks; manure or prepared fish emulsion paste* = 1-2 weeks. Use a bucket and a small aquarium pump to speed up the fermentation process. Using 3 ft. of aquarium hose, attach one end to a small aerating pump and place the other end at the bottom of a five gallon bucket. For more bubbles, use a gang valve (available at aquarium supply stores) to divide the airflow from the hose into three separate streams. All three hose streams should reach the bottom of the bucket. 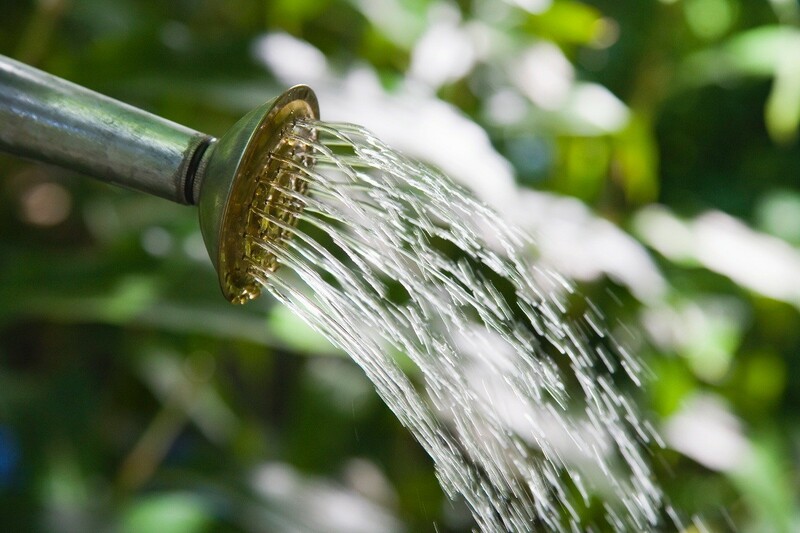 Fill the bucket with approximately 1 gallon of your compost, making sure that the ends of the hose are covered. Fill the rest of the bucket to within 6 inches of the top with water and add 1 ounce of unsulfured molasses (to provide a food for beneficial organisms). Bubble and brew for liquid fertilizer in 2-3 days. The brew will have a yeasty smell or a foamy top layer when finished. These are commonly made from cow, horse, sheep or poultry manure. Another great and often overlooked source of "barnyard" manure is the rabbit. Rabbit droppings contain one of the highest concentrations of nitrogen. They are small and compact and they don't have the pronounced smell that most other animal manures have. To Make Your Own: Use the bucket and strainer method or the bubble and brew method. Strain out solids and dilute 1:1 with water before applying to soil or as a foliar spray. This fertilizer is made up of the waste by-products of the fishing industry, namely the fish meal trade or the fish canning industry. Fish emulsion is high in nitrogen and contains readily soluble phosphorus and potassium. It should not be confused with fish meal, which is typically used as a soil conditioner and food for soil microorganisms. To Make Your Own: If you are using fresh fish, you need to compost it separately in a 5 gallon bucket before you make it into liquid fertilizer. Add fresh fish and fill at least half of the bucket with browns like leaves, straw or sawdust. Add an ounce or more of unsulfured molasses to reduce odors and encourage beneficial microbials. Cover and let rot for 1-2 weeks, opening the bucket to stir and allow for air circulation every 2 days. Once the fish is well rotted, use one of the methods above to make liquid fertilizer. Seaweed can be added in at this time. Because of its low nitrogen and phosphorus levels, seaweed is often combined with fish emulsion before being applied as a fertilizer. By itself, seaweed is a rich source of potassium, but it is considered more of a growth stimulant than a fertilizer. It contains several important trace elements, specific carbohydrates and growth hormones that benefits plants. One way to use seaweed extract effectively is to soak seeds in it for 24 hours prior to planting. It can also be applied to the soil around young plants to increase root growth or sprayed on their foliage to increase chlorophyll content while discouraging sap-sucking insects. To Make Your Own: Collect enough seaweed to fill a plastic trash can (or any container of your choice) half way to the top. The plant tissues will naturally contain some salt, but it's a good idea to rinse any excess salt off of the surface of the seaweed before putting it into the barrel. 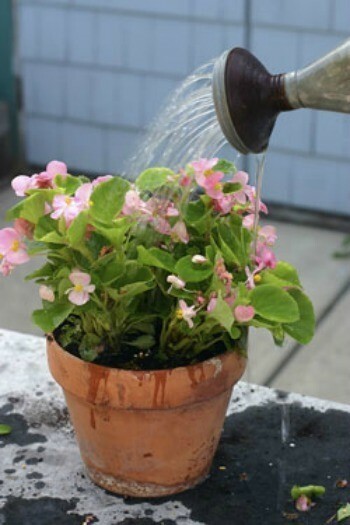 Top off the container with water and allow it to stand for 2 to 3 months. As the seaweed decomposes, the water will turn brown. Chopping it up into small pieces will help it decompose faster. The resulting liquid will be highly concentrated and should be diluted with water (1:1) before being applied. Dried seaweed is useful for making up smaller quantities or if you don't have access to fresh plants. Phosphorus is the essential nutrient primarily responsible for healthy root development and fruit and flower production. To Make Your Own: In order for it to remain suspended in liquid form, rock phosphate needs to be pulverized into a fine powder. Since most people lack the necessary tools to do this effectively, buying it is more practical for most gardeners. Comfrey, chamomile, yarrow and nettle all serve double duty in the garden. Not only can they be used for their herbal properties, but they also make wonderful all-purpose fertilizers that you can grow and harvest as needed. To Make Your Own: Use any of the above methods to steep leaves into a concentrate or liquid fertilizer tea. Like any fertilizers, organic liquid fertilizers should not be a substitute for healthy soil. Don't overdo it. Use them as a short-term solution when conditions warrant it, such as container gardening or when weather delays transplanting. 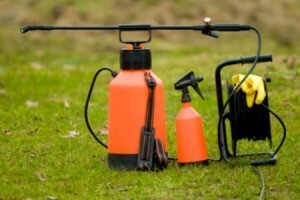 Liquid fertilizers are concentrated and can burn a plant's leaves and roots. Always dilute them with water before applying them. Plant concentrates can be stored in a cool, dry place for a few months, but manure and fish-based fertilizers should be used immediately. Container plants can be fed 2-3 times per week and houseplants every other week during the active growing season. Soil Drenches: Use liquid fertilizers to help build up microbial activity in soil and supply NPK to the plant's root system. Foliar Feeds: When plants that have suffered serious root damage, or you need a quick fix of soluble trace elements, apply liquid fertilizer as a foliar spray to plant leaves. Nettle tea prepared with 1 kg of fresh nettles for 10 liters of water is a fertilizer and when prepared with 1 kg for 20 liters of water it is a very good repulsif if sprayed on the leaves. It takes two weeks for maturation. But watch out for the very, very, special smell of the nettle tea! In France the nettle tea is called "nettle manure" Not really fair for manure which smell is not half as bad! My grandmother had told me that back in the day, they never had Miracle Gro or any other type of fast growing fertilizer. She always had the most amazing flowers. What makes a good homemade plant fertilizer for my vegetable garden? The best is to start a compost pile. You can look up compost on google. Depends on what nutrient you are lacking. You might try Epsom salts for magnesium. If it's nitrogen you are lacking, here is a country solution, literally. Make a 10:1 solution of water to urine. Water with this once a week or so. Not too much or you will have all leaves and no fruit! I found it on here the other day, but deleted it where someone made it. Make Manure Tea - This is not exactly miracle grow but your plants will love it. Mix 1 part manure (horse, cow or goat) to 3 or 4 parts water. Allow to sit for several days in the sunshine in a covered container. Strain out any remaining solid matter and save the liquid. Now add that liquid to your watering can at 1 part manure tea to 4 parts water and water your plants with this once a week or maybe once a month depending upon your plants needs. How do you make liquid fertilizer for ferns? Ferns aren't big feeders and don't usually need fertilizer. Are they outdoor or indoor? They like acid soil and if you want to give them a boost dig in used coffee grounds or tea bags or throw left over coffee or tea on them. What they do like is very loose loamy soil, lots of water and shade. 3 weeks ago I hit on the idea to make my own fertilizer for tomatoes, cucumbers, etc. I used a plastic bin, put a tap in it about 6 inches up from bottom and put all raw bits of carots, potatoes, nothing cooked, all raw, anything that we normally sling in the refuse bin. I looked at it today and it's got white froth on top. Can I really use this stuff? I am now tempted to sling it as it smells very high. I have added some Dobbies plant food liquid fertilizer for good measure, too. I have a 5 gallon bucket with water, grass clippings, weeds, and garden vegetable leaves and cleanings brewing for about 3 weeks. Do I strain off the fertilizer tea---or I can I just dip it out of the bucket, dilute it, and apply to my vegetable plants? Can I just add new green matter to the bucket and keep the tea brewing? Will the tea lose its potency as it sits in the bucket?